Gilbert engaged his artistic streak while building his prefabricated country home. Having overseen corporate office redesigns at Astral and Fido, where he worked for many years, he’d gleaned some insight from the architects with whom he had collaborated. “I pretend I’m a designer,” says Gilbert. 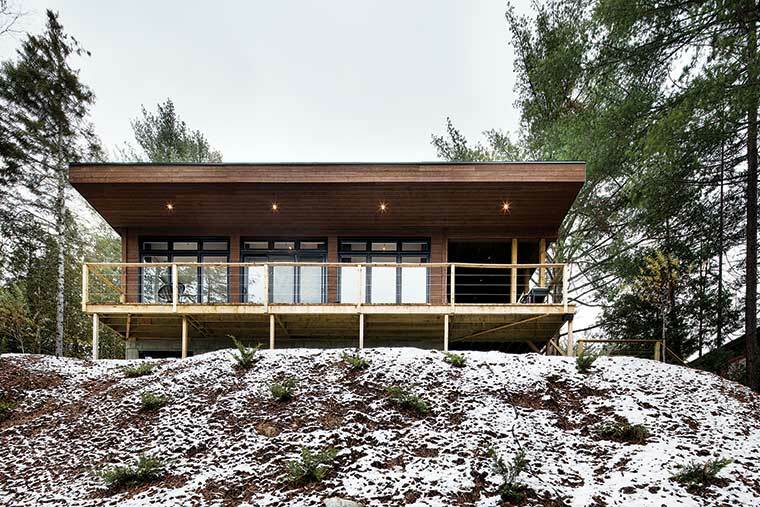 He put his aesthetic and managerial know-how into his home, a secondary residence, in the Lanaudiere region. Gilbert used the services of Goscobec, a Quebec-based company that manufactures modular homes. The home was delivered to the site in two sections from the company’s Rivière du Loup plant. Instead of adopting the design, Gilbert sketched some ideas and presented them to a Goscobec representative. “I sat down at her desk and she started using the CAD and put it all on computer,” he recalls. His plans translated into a home that has country comfort and modern lines. Bertin Rioux, manger of Goscobec, a 120-employee company that has been manufacturing prefab homes for 40 years, welcomes such requests as Gilbert’s and says most people who buy his prefabricated homes ask the company to alter the original designs. Gilbert’s design ideas for the 1,000-square-foot, one-storey home translated into a kitchen and living room that are open and well defined. These adjoining rooms are divided by a partial wall and a passageway. A three-sided gas fireplace connects the two rooms. The home is nestled on a wooded lot overlooking a lake. 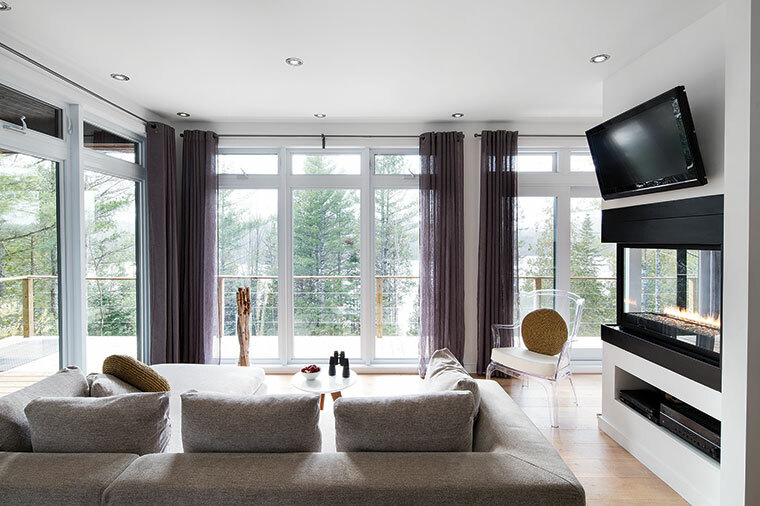 It offers its owners long views of the water beyond pine and birch trees. The surrounding woods are three birch trees poorer. 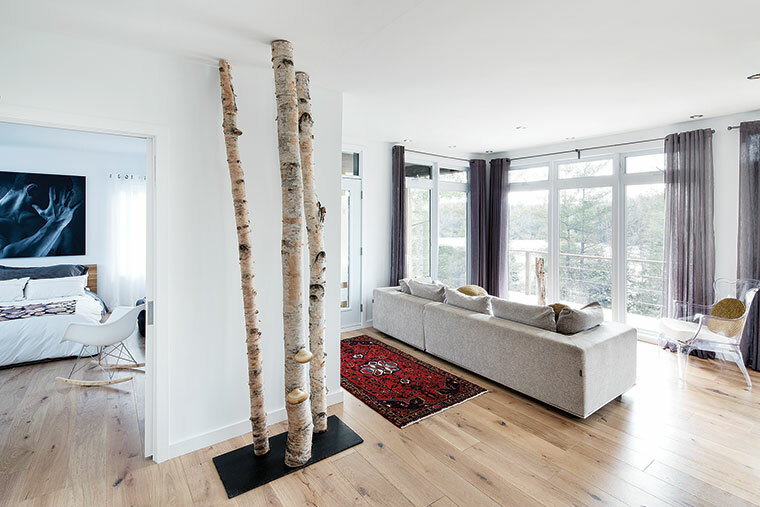 One of Gilbert’s whimsical ideas was to set up birch trunks beside a narrow wall as a rough art piece. The three bark-covered trunks – some with mushrooms attached to them – stand between floor and ceiling, appearing to grow between the basement and roof. Bird-themed bedding in the second bedroom and a wire-sculpture moose head mounted on a wall recall the wildlife outside. Organic elements include birch round cuts and a stone backsplash in the bathroom. The decor ideas evolved once the house had been delivered, the bleached oak floors laid and the plumbing installed. The kitchen backsplash is made of MDF boards, cut into a textured pattern of hills and valleys. Gilbert coated them in black metallic paint. The furnishings are a modern style with twists; a case in point is a reproduction of an Eames chair that is a rocker. and it will be apparent that his design finesse, unique art and fanciful furnishings will stretch the definition of a prefab house.